By Bill Johnson, Kris Vallotton, Kevin Dedmon, Beni Johnson, Danny Silk, and Banning Liebscher. Selecting 40 invigorating excerpts from their exciting and popular books, Pastor Bill Johnson and his Bethel Church associates have created an excellent blend of rich, generous, fortifying spiritual inspiration. Take a deep whiff of what Bill, his wife Beni, and their friends Kris Vallotton, Danny Silk, Kevin Dedmon, and Banning Liebscher have brewed specially for you. Step 1: Select an espresso-size chapter. Step 2: Sit back and relax in God’s presence. Step 3: Learn to listen to His voice. Step 4: Follow His directions. God will take you into supernatural new territory, and your explorations will not end until you are fully walking in His perfect plan for your life. Each time you enjoy a few more sips, you will be warmed and energized to step out into your world with renewed Kingdom effectiveness. 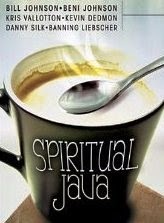 May each sip of every chapter be spiritual java for your soul. This is a book that you can begin with any chapter, and reading quickly learn to grow in grace, righteousness, and peace. Yes, it is the type of book that can be picked up each morning while drinking your coffee, and selecting a chapter of interest to read. At the end of each chapter are'Points to Ponder and a Meditation. This is an excellent book for individual spritual growth. God Called - He Needs Your Decision!